Turkey's ruling Justice and Development (AK) Party led the local elections Sunday with 16 metropolitan municipalities and 24 cities claimed by AK Party candidates, according to early results, Anadolu Agency reported. AK Party candidates garnered the support of 44.42 percent of voters as main opposition Republican People's Party (CHP) received 30.07 percent of the votes with 10 metropolitan municipalities and 10 city municipalities. Voter turnout was 84.52 percent as 192,742 out of 194,678 ballot boxes have been counted across Turkey as of Monday morning, which corresponds to some 99.01 percent of all ballots cast. People's Alliance of AK Party and the Nationalist Movement Party claimed 51.67 percent while the Nation Alliance of CHP and Iyi Party gets 37.53 percent of overall votes. In Istanbul, AK Party's candidate Binali Yildirim was leading with 48.7 percent and in the capital Ankara, CHP candidate Mansur Yavas was ahead with 50.9 percent, according to unofficial results. In the western resort city of Izmir CHP's candidate, Mustafa Tunc Soyer won with 58.02 percent and in the southwestern province of Diyarbakir People's Democratic Party (HDP) candidate, Adnan Selcuk Mizrakli was ahead with 62.96 percent. In the central Konya province, AK Party candidate Ugur Ibrahim Atalay won a sweeping lead with 70.69 percent of the votes. In the southern Antalya province, CHP candidate Muhittin Bocuk led with 50.63 percent. AK Party candidate Fatma Sahin is elected metropolitan mayor of the southeastern province of Gaziantep. In the northwestern province of Bursa AK Party candidate, Alinur Aktas was elected mayor with 49.6 percent. In the northwestern province of Kirklareli independent candidate, Mehmet Siyam Kesimoglu was elected with 37.53 percent voter support. In the southwestern province of Tunceli Communist Party of Turkey candidate, Fatih Mehmet Macoglu was elected mayor with 32.37 percent. In the southwestern province of Sirnak AK Party candidate Mehmet Yarka is elected mayor. AK Party candidate Erdal Arikan won in the eastern Bingol province. AK Party's Sahin Serifogullari is elected mayor of the eastern province of Elazig and the party's Selahattin Gurkan is elected mayor of the eastern Malatya province. AK Party candidate Mehmet Sekmen led in the eastern Erzurum province. Turkey's ruling Justice and Development (AK) Party is leading in local elections Sunday as of 7.45 pm (1645 GMT) with 18 metropolitan municipalities claimed by AK Party candidates including Istanbul, Konya, and Sanliurfa, Anadolu Agency reported. AK Party gets 46.45 percent of overall votes as main opposition Republican People's Party (CHP) gets 30.70 percent of overall votes with 10 metropolitan municipalities and 10 city municipalities. Voter turnout is 83.48 percent as 129,560 out of 194,678 ballot boxes have been counted across Turkey which amounts to some 66.08 percent of all ballots cast. People's Alliance of AK Party and the Nationalist Movement Party claims 52,31 percent while the Nation Alliance of CHP and Iyi Party gets 37.21 percent of overall votes. In Istanbul, AK Party's candidate Binali Yildirim is leading with 49.75 percent and in the capital Ankara, CHP candidate Mansur Yavas is ahead with 49.71 percent, according to early results. In the western resort city of Izmir CHP's candidate, Mustafa Tunc Soyer is leading with 58.21 percent and in the southwestern province of Diyarbakir People's Democratic Party (HDP) candidate, Adnan Selcuk Mizrakli is ahead with 61.92 percent. In the central Konya province, AK Party candidate Ugur Ibrahim Atalay is leading with a sweeping 71.10 percent of the votes. In the southern Antalya province, CHP candidate Muhittin Bocuk is leading with 50.31 percent. In the northwestern province of Bursa AK Party candidate, Alinur Aktas is ahead with 49.76 percent. In the southwestern province of Tunceli Communist Party of Turkey candidate Fatih Mehmet Macoglu is leading with 32.37 percent and in Sirnak AK Party candidate Mehmet Yarka is leading with 62.07 percent. In the northwestern province of Kirklareli independent candidate, Mehmet Siyam Kesimoglu is leading with 37.33 percent. AK Party candidate Rahmi Metin bagged 25,447 votes, elected mayor in the Black Sea province of Rize. In the central Sivas province, AK Party candidate Hilmi Bilgin is elected mayor with 84,246 votes. In the northeastern province of Artvin, CHP's Demirhan Elcin is elected mayor with 6,853 votes. AK Party candidate Fatma Sahin is elected mayor of the southeastern province of Gaziantep. CHP candidate Faruk Demir is elected mayor of the northeastern province of Ardahan. 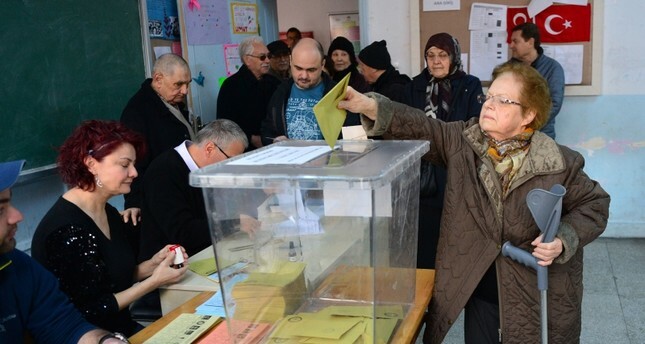 The voting ended for local elections in all 81 provinces across Turkey at 5 p.m. local time (1400GMT) on March 31, Hurriyet Daily News reported. According to the Supreme Election Council (YSK) decision, voting started in 32 out of Turkey's 81 provinces at 7 a.m. local time (0400GMT) and ended at 4 p.m. (1300GMT). In the remaining provinces, polling stations opened at 8 a.m. local time (0500GMT) and closed at 5.00 p.m. local time (1400GMT). Voters living in Turkey's larger cities voted to elect a mayor for the entire city, as well as district municipal mayors, city council members, muhtars (neighborhood officials), and members of elder councils. The voters chose from 12 political parties competing in the local elections. Municipal elections start in Turkey. As many as 13 political parties will take part in the municipal elections in Turkey, according to local media. The Felicity Party, the Independent Turkey Party, the Communist Party of Turkey, the Homeland Party, the Great Unity Party, the Free Cause Party, the Republican People’s Party, the Justice and Development Party, the Democratic Party, the Nationalist Movement Party, the Good Party, the Peoples’ Democratic Party and the Democratic Left Party will take part in the elections. Earlier, President Recep Tayyip Erdogan nominated the candidacy of ex-Minister of Economy Nihat Zeybekchi for the post of the head of the municipality of Izmir, as well as the candidacy of Binali Yıldırım for the post of the head of the Istanbul municipality. The municipal elections in Turkey held every five years.